I love this Crab, Avocado and Mango Cocktail dish using local spider crab. It is a great ingredient to use and I am amazed about how much of it we as an island export rather than use at home. I love cracking crabs, and getting to use the freshest ingredients just off the boats means the texture and flavors are at their best. When you combine this amazing crab with the flavors of mango and avocado you get a great dish. As it is coming into season, going foraging for samphire seaweed locally would be a great additional to this dish also. 4. Start layering; first layer of diced avocado, then crab, then mango and then another thicker layer of crab. Finish with mango on top. 5. Gently firm down the layers with one hand and pull up the mold to remove it. 6. You can use extra virgin olive oil, basil pesto and balsamic reduction to dress the plate. 7. To finish the dish lightly dress the leaves with extra virgin olive oil and place few on the top of the tian. 8. To add colour place some halved cherry tomatoes around the plate. Richy Virahsawmy has been working in kitchens since he was 14 years old. 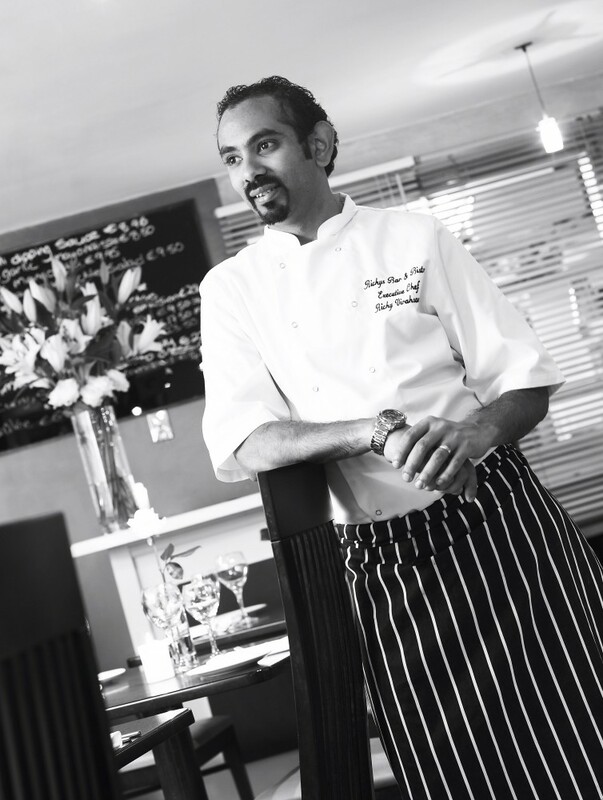 Cooking is in his blood being of Mauritian background, and he trained in London and started his professional career in the Strand Palace Hotel as a first commis chef. He worked his way up the ranks in kitchens, and was promoted to a senior sous chef at the age of just 21. Richy then worked in senior chef positions at the UK’s Department of Trade and Industry and has worked at No 10 Downing Street catering for banquets for the Prime Minister, moving on as Executive head chef at the world’s second largest pharmaceutical company Astra Zeneca in Park Lane London before moving to Ireland to work at Clonakilty based Inchydoney Lodge and Spa in West Cork. In May 2002 he realised his dream of opening his own restaurant and opened Richy’s Restaurant. In 2012 Richy also opened RCafe in Clonakilty to turn the business into a 7 day a week multi-operational business. For more information on Richy, and Richy’s Restaurant visit www.richysrestaurant.com.